Nuby Octopus Bath Time Toss Only $6.99 + FREE Prime Shipping - Delivery for Christmas! You are here: Home / Great Deals / Amazon Deals / Nuby Octopus Bath Time Toss Only $6.99 + FREE Prime Shipping – Delivery for Christmas! Nuby Octopus Bath Time Toss Only $6.99 + FREE Prime Shipping – Delivery for Christmas! Looking for some new bath toys for your kiddos? 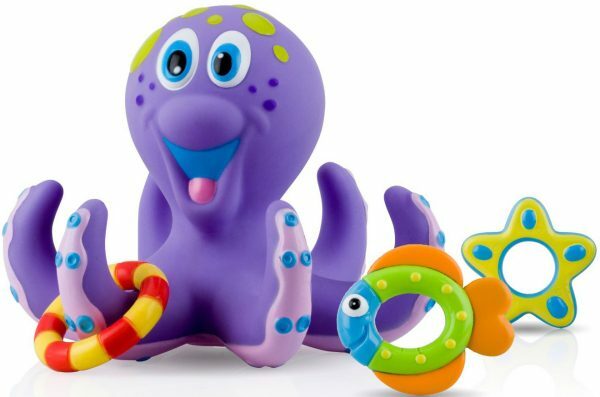 Check out this one I found – get the Nuby Octopus Bath Time Toss Toy for just $6.99! And, you’ll get FREE shipping with Amazon Prime or Super Saver Shipping, which means you’ll get it in time for Christmas! This is a great toy because your kids will have fun with it while learning hand-eye coordination when tossing the rings!